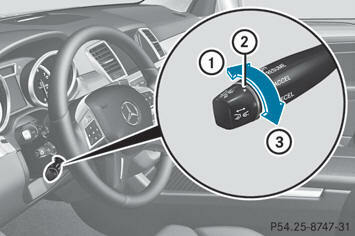 The cruise control is a convenience system designed to assist the driver during vehicle operation. The driver is and must always remain responsible for the vehicle's speed and for safe brake operation. Only use the cruise control if the road, traffic, and weather conditions make it advisable to travel at a constant speed. - The use of the cruise control can be dangerous on winding roads or in heavy traffic because conditions do not allow safe driving at a constant speed. - The use of the cruise control can be dangerous on slippery roads. Rapid changes in tire traction can result in wheel spin and loss of control. - Deactivate the cruise control when driving in fog. The "Resume" function should only be operated if the driver is fully aware of the previously set speed and wishes to resume this particular preset speed. The cruise control brakes automatically so that the set speed is not exceeded. Cruise control maintains a constant road speed for you. It brakes automatically in order to avoid exceeding the set speed. On long and steep downhill gradients, especially if the vehicle is laden or towing a trailer, you must select shift range 1, 2 or 3 in good time. By doing so, you will make use of the braking effect of the engine, which relieves the load on the brake system and prevents the brakes from overheating and wearing too quickly. Use cruise control only if road and traffic conditions make it appropriate to maintain a steady speed for a prolonged period. You can set any road speed above 20 mph (30 km/h). Cruise control should not be activated during off-road driving. When you activate cruise control, the stored speed is shown in the multifunction display for five seconds. In the multifunction display, the segments between the stored speed and the maximum speed light up. To activate cruise control, all of the following activation conditions must be fulfilled: - your vehicle must not be secured by the electric parking brake. - you are driving faster than 20 mph (30 km/h). - ESP® must be active, but not intervening. - the transmission must be in position D.
- DSR must be deactivated. You can adopt the current speed if you are driving faster than 20 mph (30 km/h). – Accelerate the vehicle to the desired speed. – Briefly press the cruise control lever up 1 or down 2. – Remove your foot from the accelerator pedal. Cruise control is activated. The vehicle automatically maintains the stored speed. Cruise control may be unable to maintain the stored speed on uphill gradients. The stored speed is resumed when the gradient evens out. Cruise control maintains the stored speed on downhill gradients by automatically applying the brakes. The set speed stored in memory should only be set again if prevailing road conditions and legal speed limits permit. Possible acceleration or deceleration differences arising from returning to the preset speed could cause an accident and/or serious injury to you and others. – Briefly pull the cruise control lever towards you 4. The first time cruise control is activated, it stores the current speed or regulates the speed of the vehicle to the previously stored speed. Keep in mind that it may take a brief moment until the vehicle has made the necessary adjustments. Increase or decrease the set vehicle speed to a value that the prevailing road conditions and legal speed limits permit. Otherwise, sudden and unexpected acceleration or deceleration of the vehicle could cause an accident and/or serious injury to you and others. – Press the cruise control lever up 1 for a higher speed or down 2 for a lower speed. – Keep the cruise control lever pressed until the desired speed is reached. – Release the cruise control lever. The new speed is stored. 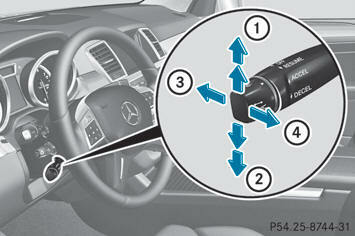 – Making adjustments in 1 mph increments (1 km/h increments): briefly press the cruise control lever to the pressure point. The last stored speed is increased or decreased in 1 mph increments (1 km/h increments). – Making adjustments in 5 mph increments (10 km/h increments): briefly press the cruise control lever beyond the pressure point. The last stored speed is increased or decreased in 5 mph increments (10 km/h increments). Cruise control is not deactivated if you depress the accelerator pedal. For example, if you accelerate briefly to overtake, cruise control adjusts the vehicle's speed to the last speed stored after you have finished overtaking. – Briefly press the cruise control lever forwards 3. Cruise control is automatically deactivated if: - you engage the electric parking brake. - you are driving below 20 mph (30 km/h). - ESP® intervenes or you deactivate ESP®. - you shift the transmission to position N while driving. If cruise control is deactivated, you will hear a warning tone. You will see the Cruise Control Off message in the multifunction display for approximately five seconds. When you switch off the engine, the last speed stored is cleared. The DISTRONIC PLUS requires familiarity with its operational characteristics. We strongly recommend that you review the following information carefully before operating the system. The DISTRONIC PLUS is a convenience system. Its speed adjustment reduction capability is intended to make cruise control more effective and usable when traffic speeds vary. It is not however, intended to, nor does it, replace the need for extreme care. The responsibility for the vehicle's speed, distance to the preceding vehicle and, most importantly, brake operation to ensure a safe stopping distance, always remains with the driver. The DISTRONIC PLUS cannot take street and traffic conditions into account. Complex driving situations are not always fully recognized by the DISTRONIC PLUS. This could result in wrong or missing distance warnings. The DISTRONIC PLUS adaptive cruise control is not a substitute for active driving involvement. It does not react to pedestrians or on stationary objects, nor does it recognize or predict the curvature and lane layout or the movement of preceding vehicles. The DISTRONIC PLUS can only apply a maximum of 40% of the vehicle's braking power. The DISTRONIC PLUS may not detect narrow vehicles possibly driving in front of you, such as motorcycles and vehicles driving in an offset formation. It is the driver's responsibility at all times to be attentive to the road, weather and traffic conditions. Additionally, the driver must provide the steering, braking and other driving inputs necessary to remain in control of the vehicle. High-frequency sources such as toll stations, speed measuring systems etc. can cause the DISTRONIC PLUS system to temporarily cease functioning. The DISTRONIC PLUS cannot take road and traffic conditions into account. Only use the DISTRONIC PLUS if the road, weather and traffic conditions make it advisable to travel at a constant speed. Use of the DISTRONIC PLUS can be dangerous on slippery roads. Rapid changes in tire traction can result in wheel spin and loss of control. The DISTRONIC PLUS does not function in adverse sight and distance conditions. Do not use the DISTRONIC PLUS during conditions of fog, heavy rain, snow or sleet. The DISTRONIC PLUS cannot take weather conditions into account. Switch off the DISTRONIC PLUS or do not switch it on if: - roads are slippery or covered with snow or ice. The wheels could lose traction while braking or accelerating, and the vehicle could skid. 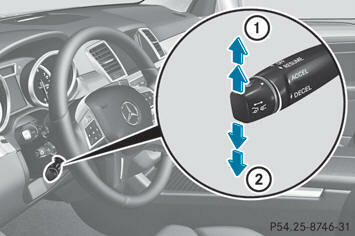 - the DISTRONIC PLUS system sensor covers are dirty or visibility is diminished due to snow, rain or fog, for example. The distance control system functionality could be impaired. Always pay attention to surrounding traffic conditions even while the DISTRONIC PLUS is switched on. Otherwise, you may not be able to recognize dangerous situations until it is too late. This could cause an accident in which you and/or others could be injured. Your undivided attention to street and traffic conditions is necessary at all times whether DISTRONIC PLUS is active or not. The use of DISTRONIC PLUS can be dangerous on winding roads or in heavy traffic because conditions do not allow safe driving at a constant speed. DISTRONIC PLUS does not react to stationary objects on the road (for example, a vehicle stopped in traffic or an abandoned vehicle). DISTRONIC PLUS likewise does not react to oncoming vehicles. - in complex driving situations, for example in construction sites on an expressway In these situations DISTRONIC PLUS will maintain the set speed if it is not deactivated. DISTRONIC PLUS is intended only for maintaining a set speed and a set distance from the objects moving in front of the vehicle. instrument cluster is illuminated if the DISTRONIC PLUS system calculates that the distance to the vehicle ahead and your vehicle's current speed indicate that the DISTRONIC PLUS will not be capable of slowing the vehicle sufficiently to maintain the preset following distance, which creates a danger of a collision. Immediately brake the vehicle to increase your distance to the preceding vehicle. The warning sound is intended as a final caution in which you should intercede with your own braking inputs to avoid a potentially dangerous situation. Do not wait for the operation of the warning signal to intercede with your own braking. This will result in potentially dangerous emergency braking which will not always result in an impact being avoided. Tailgating increases the risk of an accident. DISTRONIC PLUS brakes your vehicle with a maximum deceleration of 13 ft/s2(4 m/s2). This is equivalent to approximately 40 % of your vehicle's maximum possible deceleration. You need to brake yourself to prevent a collision. DISTRONIC PLUS brakes the vehicle to restore the set distance from the vehicle ahead or the set speed. If you do not receive visual or acoustic warning signals during a critical traffic situation, DISTRONIC PLUS has either not recognized the collision risk, has been deactivated or is malfunctioning. Remember, whether or not DISTRONIC PLUS is operating, it is ultimately always the drivers responsibility to apply the brakes in order to control the vehicle and avoid a collision. The vehicle can be braked when DISTRONIC PLUS is activated. For this reason, deactivate DISTRONIC PLUS if the vehicle is to be set in motion by other means (e.g. in a car wash or by towing). If you want DISTRONIC PLUS to assist you, the radar sensor system must be activated and operational. 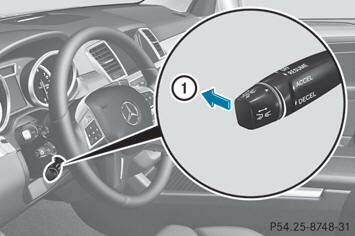 DISTRONIC PLUS regulates the speed and automatically helps you maintain the distance to the vehicle detected in front. It brakes automatically in order to avoid exceeding the set speed. If a slower-moving vehicle is detected in front, DISTRONIC PLUS causes your vehicle to brake and maintain the preset distance to the vehicle in front. If there is no vehicle driving in front of you, DISTRONIC PLUS functions like cruise control at a speed range between 20 mph (Canada: 30 km/h) and 120 mph (Canada: 200 km/h). If a vehicle is driving in front of you, it functions at a speed range between 0 mph (0 km/h) and 120 mph (Canada: 200 km/h). As DISTRONIC PLUS transmits radar waves, it can resemble the radar detectors of the responsible authorities. You can refer to the applicable section in the Operator's Manual if there are any questions concerning this. Removal, tampering, or altering of the device will void any warranties, and is not permitted. Do not tamper with, alter, or use in any non-approved way. In order to activate DISTRONIC PLUS, the following conditions must be fulfilled: - the engine must be started. It may take up to two minutes after pulling away before DISTRONIC PLUS is operational. - the electric parking brake must be released. - the driver's door must be closed when you shift from P to D or your seat belt must be fastened. - the front-passenger door and rear doors must be closed. - the vehicle must not skid. When driving at speeds below 20 mph (30 km/h), you can only activate DISTRONIC PLUS if the vehicle in front has been detected and is shown in the multifunction display. If the vehicle in front is no longer detected and displayed, DISTRONIC PLUS switches off and a tone sounds. – Briefly pull the cruise control lever towards you 4, or briefly press up 1 or down 2. – Keep the cruise control lever pressed up 1 or down 2 until the desired speed is set. If the vehicle in front of you is stationary, you can only activate DISTRONIC PLUS once your vehicle is stationary as well. - Briefly pull the cruise control lever towards you 4, or briefly press up 1 or down 2. DISTRONIC PLUS can only be activated at under 20 mph (30 km/h) if a vehicle in front has been detected. Therefore, the DISTRONIC PLUS distance display in the instrument cluster should be activated. - Keep the cruise control lever pressed up 1 or down 2 until the desired speed is set. You can use the cruise control lever to set the stored speed and the control on the cruise control lever to set the specified minimum distance. When DISTRONIC PLUS is activated, one or two segments 2 in the set speed range light up. For design reasons, the speed displayed in the speedometer may differ slightly from the speed set for DISTRONIC PLUS. - Select the Distance Display function using the on-board computer. – If the vehicle in front pulls away: remove your foot from the brake pedal. – Briefly pull the cruise control lever towards you. DISTRONIC PLUS then no longer brakes your vehicle. In such cases, control the distance from vehicles travelling in front with the brake alone. You could otherwise cause an accident and thereby injure yourself and others. The driver remains fully responsible for the vehicle's distance from other vehicles, the speed being driven and for braking in good time. If DISTRONIC PLUS detects that the vehicle in front has increased speed, it increases your driving speed, but only up to the speed you have stored. - you are driving faster than 40 mph (60 km/h). - DISTRONIC PLUS is maintaining the distance to a vehicle in front. - you switch on the appropriate turn signals. - DISTRONIC PLUS does not detect a danger of collision. If these conditions are met, your vehicle is accelerated. Acceleration will be interrupted if changing lanes takes too long or if the distance between your vehicle and the vehicle in front becomes too small. DISTRONIC PLUS and Active Blind Spot Assist are only aids designed to assist driving. They do not relieve you of the responsibility of paying attention. The driver remains fully responsible for the vehicle's distance from other vehicles, the vehicle's speed and for braking in good time. Always pay attention to traffic conditions and your surroundings. The following function is not operational in all countries. Even if the vehicle in front leaves the detection range, DISTRONIC PLUS temporarily maintains the current driving speed and does not accelerate. This is based on the current map data in the navigation system. Afterwards, the vehicle accelerates back to the set speed you specified. Never get out of the vehicle when DISTRONIC PLUS is activated. DISTRONIC PLUS must also never be operated, activated or deactivated by a passenger or from outside the vehicle. DISTRONIC PLUS does not replace the electric parking brake and must not be used for parking. The DISTRONIC PLUS braking effect is canceled and the vehicle can start moving if: - DISTRONIC PLUS is deactivated using the cruise control lever. - there is a malfunction in the system or an interruption in the power supply, e.g. battery failure. - the electrical system in the engine compartment, the battery or the fuses are tampered with. - the battery is disconnected. If you wish to leave the vehicle or park it, deactivate DISTRONIC PLUS and secure the vehicle against rolling away. After a time, the electric parking brake secures the vehicle and relieves the service brake. - the driver's door is open and the driver's seat belt is unfastened. - the engine is switched off. - a system malfunction occurs. - the power supply is not sufficient. 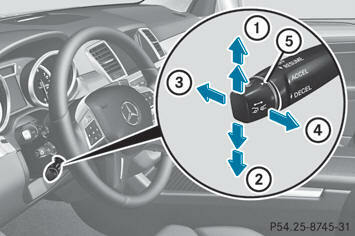 – Press the cruise control lever up 2 for a higher speed or down 3 for a lower speed. The last stored speed increases or decreases in 5 mph increments (10 km/h increments). It is up to the driver to exercise discretion to select the appropriate setting given road conditions, traffic, driver's preferred driving style and applicable laws and driving recommendations for safe following distance. You can set the specified minimum distance for DISTRONIC PLUS by varying the time span between one and two seconds. With this function, you can set the minimum distance that DISTRONIC PLUS keeps to the vehicle in front, dependent on vehicle speed. You can see this distance in the multifunction display. – To increase: turn control 2 in direction 3. – To decrease: turn control 2 in direction 1. Make sure that you maintain a sufficiently safe distance from the vehicle in front. Adjust the distance to the vehicle in front if necessary. The DISTRONIC PLUS switches off and releases the brakes when the vehicle decelerates below the minimum speed of 20 mph (30 km/h) by operation of the system unless the DISTRONIC PLUS detects a vehicle directly ahead of you. At that time the driver must apply the brakes in order to reduce vehicle speed further or bring it to a stop. – Briefly press the cruise control lever forwards 1. – Brake, unless the vehicle is stationary. When you deactivate DISTRONIC PLUS, the DISTRONIC PLUS Off message is shown in the multifunction display for approximately five seconds. - the transmission is in the P, R or N position. - you switch off the radar sensor system. - you pull the cruise control lever towards you in order to pull away and the frontpassenger door or one of the rear doors is open. - the vehicle has skidded. If DISTRONIC PLUS is deactivated, you will hear a warning tone. The DISTRONIC PLUS Off message is shown in the multifunction display for approximately five seconds. You can select the distance display in the Assistance menu (Y page 232) of the onboard computer. – Select the Distance Display function using the on-board computer. The DISTRONIC PLUS works to maintain the speed selected by the driver unless a moving obstacle proceeding directly ahead of it in the same travel direction is detected (e.g. following another vehicle ahead of you at your set distance). - Your vehicle can pass another vehicle after you have changed lanes. - While in a sharp turn or if the preceding vehicle is in a sharp turn, the DISTRONIC PLUS could lose sight of the preceding vehicle. Your vehicle could then accelerate to the previously selected speed. The driver must always be alert, observe all traffic and intercede as required by means of steering or braking the vehicle. The DISTRONIC PLUS should not be used in snowy or icy road conditions. DISTRONIC PLUS may mistakenly detect vehicles that are crossing your lane. Activating DISTRONIC PLUS at traffic lights with crossing traffic, for example, could cause your vehicle to pull away unintentionally. The vehicle is kept stationary without the driver having to depress the brake pedal. The braking effect is canceled and the HOLD function deactivated when you depress the accelerator pedal to pull away. You can activate the HOLD function if: Rthe vehicle is stationary. Rthe driver's door is closed or if your seat belt is fastened. Rthe electric parking brake is released. Rthe transmission is in position D, R or N.
– Make sure that the activation conditions are met. – Depress the brake pedal. – Quickly depress the brake pedal further until HOLD display 1 appears in the multifunction display. The HOLD function is activated. You can release the brake pedal. If depressing the brake pedal the first time does not activate the HOLD function, wait briefly and then try again. The vehicle's brakes are applied when the HOLD function is activated. For this reason, deactivate the HOLD function if the vehicle is to be set in motion by other means (e.g. in a car wash or by towing). - you accelerate and the transmission is in position D or R.
- the transmission is in position P.
- you apply the brakes again with a certain amount of pressure until HOLD disappears from the multifunction display. - you secure the vehicle using the electric parking brake. - you activate DISTRONIC PLUS. Never get out of the vehicle when the HOLD function is activated. The HOLD function must never be operated or deactivated by a passenger or from outside the vehicle. The HOLD function does not replace the electric parking brake and must not be used for parking. The braking effect of the HOLD function is canceled and the vehicle could roll away if: - the HOLD function is deactivated by depressing the accelerator pedal or the brake pedal. AIRMATIC enables a suspension tuning setting to be selected and regulates the damping behavior and level of your vehicle. The system comprises a minimum of two components: ADS (Adaptive Damping System) (Y page 180) and level control (Y page 181). Your vehicle may also be equipped with the Active Curve System. Observe the notes on driving with a trailer. Your selection remains stored even if you remove the SmartKey from the ignition lock. In Comfort mode, the driving characteristics of your vehicle are more comfortable. Select this mode if you favor a more comfortable driving style, but also when driving fast on straight roads, e.g. freeways. The Active Curve System uses active stabilizers to optimize both driving comfort and vehicle agility. Depending on the ADS mode selected (Y page 180), the Active Curve System also changes the setting. If you select ADS comfort mode (Y page 180), the vehicle is lowered to highspeed level as the speed increases. As the vehicle decelerates, the vehicle is raised back up to highway level. If you select ADS sport mode (Y page 180), the vehicle skips highway level and lowers directly to high-speed level depending on the basic setting (Y page 182). Make sure no one is near the wheel housing or under the vehicle when you lower the vehicle while it is standing still. Limbs could become wedged into or under the vehicle. For safety reasons, the vehicle can only be lowered with all doors and the tailgate closed. Lowering is interrupted if a door or the tailgate is opened and will continue after the door is closed again. Make sure that there is always sufficient ground clearance to prevent damage to the vehicle. Remove the key from the ignition before raising one or more wheels with the appropriate equipment. For information about driving off-road. Only select raised level when this is appropriate for the road conditions. Otherwise, fuel consumption may increase and handling may be affected. Once the vehicle has reached raised level, indicator lamp 2 remains lit. The Vehicle Rising message disappears from the multifunction display. If you attempt to select the raised level at a speed of over 40 mph (64 km/h), the Drive More Slowly message appears in the multifunction display. Once highway level has been reached, indicator lamp 2 goes out. The Lowering message disappears from the multifunction display. The vehicle automatically selects highway level if you are driving at a speed above 50 mph (80 km/h) or if you drive for approximately 20 seconds between 40 mph (64 km/h) and 50 mph (80 km/h). Depending on the ADS mode selected (Y page 180), the vehicle is lowered to high-speed level at higher speeds. The PARKTRONIC is a supplemental system. It is not intended to, nor does it replace, the need for extreme care. The responsibility during parking and other critical maneuvers always remains with the driver. Make sure no persons or animals are in or near the area in which you are parking/maneuvering. Otherwise, they could be injured. PARKTRONIC is an electronic parking aid with ultrasonic sensors. It indicates visually and audibly the distance between your vehicle and an object. PARKTRONIC is deactivated at speeds above 11 mph (18 km/h). It is reactivated at lower speeds. PARKTRONIC monitors the area around your vehicle using six sensors in the front bumper and four sensors in the rear bumper. The sensors must be free of dirt, ice and slush; otherwise they may not function correctly. Clean the sensors regularly, taking care not to scratch or damage them. When parking, pay particular attention to objects above or below the sensors, such as flower pots or trailer drawbars. PARKTRONIC does not detect such objects when they are in the immediate vicinity of the vehicle. You could damage the vehicle or the objects. The sensors may not detect snow and other objects that absorb ultrasonic waves. Ultrasonic sources such as an automatic car wash, the compressed-air brakes on a truck or a pneumatic drill could cause PARKTRONIC to malfunction. PARKTRONIC may not function correctly on uneven terrain. If there is an obstacle within this range, the relevant warning displays light up and a warning tone sounds. If the distance falls below the minimum, the distance may no longer be shown. The warning displays show the distance between the sensors and the obstacle. The warning display for the front area is located on the dashboard above the center air vents. The warning display for the rear area is in the roof lamp in the rear compartment. The warning display for each side of the vehicle is divided into five yellow and two red segments. PARKTRONIC is operational if yellow segments showing operational readiness 3 light up. The selected transmission position and the direction in which the vehicle is rolling determine which warning display is active when the engine is running. One or more segments light up as the vehicle approaches an obstacle, depending on the vehicle's distance from the obstacle. - sixth segment onwards, you will hear an intermittent warning tone for approximately two seconds. - seventh segment onwards, you will hear a warning tone for approximately two seconds. This indicates that you have now reached the minimum distance. If indicator lamp 1 lights up, PARKTRONIC is deactivated. Active Park Assist is then also deactivated. PARKTRONIC is automatically activated when you turn the SmartKey to position 2 in the ignition lock. PARKTRONIC is deactivated for the rear area when you establish an electrical connection between your vehicle and a trailer. Fold in the ball coupling if the trailer tow hitch is not required. PARKTRONIC measures the minimum detection range to an obstacle from the bumper, not the ball coupling. Only the red segments in the PARKTRONIC warning displays are lit. You also hear a warning tone for approximately two seconds. PARKTRONIC is deactivated after approximately 20 seconds, and the indicator lamp in the PARKTRONIC button lights up. PARKTRONIC has malfunctioned and has switched off. – If problems persist, have PARKTRONIC checked at a qualified specialist workshop. PARKTRONIC is deactivated after approximately 20 seconds. The PARKTRONIC sensors are dirty or there is interference. – Clean the PARKTRONIC sensors. – Switch the ignition back on. The problem may be caused by an external source of radio or ultrasound waves. – See if PARKTRONIC functions in a different location. Active Parking Assist is an electronic parking aid with ultrasound. Ultrasound is used to measure the road on both sides of the vehicle. A suitable parking space is indicated by the parking symbol. Active steering intervention can assist you during parking. You may also use PARKTRONIC (Y page 183). When PARKTRONIC is switched off, Active Parking Assist is also unavailable. Active Parking Assist is merely an aid and may sometimes recommend parking spaces that are not suitable for parking. For example, these might be spaces where parking is prohibited, driveways, unsuitable surfaces, etc. Active Parking Assist measures the parking space as you drive past it. Any later changes to the parking space are not taken into account. For instance, this may be the case when the vehicle parked in front of or behind the space changes its position or when an obstacle is moved into the parking space. Active Parking Assist does not relieve you of the responsibility of paying attention. If you rely solely on Active Parking Assist, you could cause an accident and injure yourself and others. You are always responsible for safety and must continue to pay attention to your immediate surroundings when parking and maneuvering. Objects located above the height range of Active Parking Assist will not be detected when the parking space is measured. These are not taken into account when the parking procedure is calculated, e.g. overhanging loads, tail sections or loading ramps of goods vehicles. In some circumstances, Active Parking Assist may therefore guide you into the parking space too early. This may lead to a collision. For this reason, you should avoid using Active Parking Assist in such situations. The front of the vehicle will veer out in the direction of the oncoming traffic during the parking operation. In some cases, the vehicle will also take you onto sections of the oncoming lane during the parking procedure. You are responsible for safety at all times and must pay attention to any road users approaching or passing. Stop the vehicle if necessary or cancel the Active Parking Assist parking procedure. - on narrow roads, drive past the parking space as close as possible. - parking spaces that are littered, overgrown or partially occupied by trailer drawbars might be identified incorrectly or not at all. - snowfall or heavy rain may lead to a parking space being measured inaccurately. - pay attention to the PARKTRONIC (Y page 184) warning messages during the parking procedure. - you can intervene in the steering procedure to correct it at any time. Active Parking Assist will then be canceled. - when transporting a load which protrudes from your vehicle, you should not use Active Parking Assist. - never use Active Parking Assist when snow chains or an emergency spare wheel are mounted. - make sure that the tire pressures are always correct. This has a direct influence on the parking characteristics of the vehicle. - the way your vehicle is positioned in the parking space after parking is dependent on various factors. These include the position and shape of the vehicles parked in front and behind it and the conditions of the location. In some cases, Active Parking Assist may guide you too far into a parking space, or not far enough into it. In some cases, it may also lead you across or onto the curb. If necessary, you should abort the parking procedure with Active Parking Assist. - you can also engage forward gear prematurely. The vehicle redirects and does not drive as far into the parking space. Should the gear change occur too soon to achieve a sensible parking position, the parking procedure will be aborted. If unavoidable, you should drive over obstacles such as curbs slowly and not at a sharp angle. Otherwise, you may damage the wheels or tires. When a parking space has been detected, an arrow towards the right or the left also appears. A parking space will be displayed to you as you drive by until you are approximately 50 ft (15 m) away from it. PARKTRONIC and Active Parking Assist are merely parking aids and may not detect all obstacles. They do not relieve you of the responsibility of paying attention. You are always responsible for safety and must continue to pay attention to your immediate surroundings when parking and maneuvering. You could otherwise endanger yourself and others. – Stop the vehicle when the parking space symbol shows the desired parking space in the instrument cluster. – Shift the transmission to position R.
message appears in the multifunction display. steering wheel or pull away. The Park Assist Active Accelerate and Brake Observe Surroundings message appears in the multifunction display. When parking, you need to make sure that no obstacles are located in the vicinity of the vehicle during the entire operation. Active Parking Assist does not relieve you of the responsibility of paying attention. It merely aids you by intervening actively in the steering. To stop the vehicle or to avoid an accident, you need to apply the brakes yourself. – Let go of the multifunction steering wheel.